The Mabel-Canton School Board recently signed a new student enrollment agreement with Decorah; the Decorah-North Winneshiek Interim School Board is expected to approve the agreement Monday, Feb. 11. 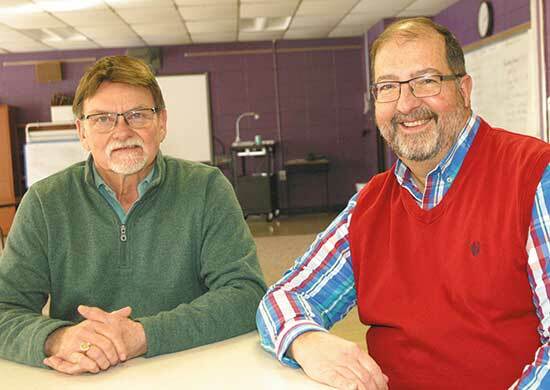 Decorah Superintendent Mike Haluska and Mabel-Canton Superintendent Gary Kuphal recently explained the specifics of the agreement, which follows a re-organizational agreement between the North Winneshiek and Decorah School districts going into effect July 1 of this year. The agreement states that students grades K-12 in the Decorah School District (the newly reorganized Decorah District, which includes North Winneshiek), who live closer to the Mabel-Canton attendance center than any Decorah center can attend Mabel-Canton for school, provided the proper forms have been submitted by March 1. The issue came to the districts’ attention two years ago when parents of students who lived in the Decorah District but were open-enrolling their students to the North Winneshiek District realized the North Winneshiek tuition reciprocity agreement that was in place with Mabel would not automatically transfer to Decorah after reorganization. Under those circumstances, students in the Decorah District wanting to attend Mabel-Canton would have to pay tuition to do so. “The Iowa Department of Education was clear that you can't bypass the home district,” explained Haluska. At the time, Decorah and Mabel-Canton settled on a two-year agreement, which will expire at the end of June, because the existing Decorah and North Winneshiek boards were not legally in a position to make agreements that would last beyond the reorganization date of July 1, 2019. According to Kuphal, the local agreement is in line with an interstate contract between Iowa and Minnesota, which states that students across the state line who live closer to a specific district are legally allowed to attend that district. It is up for renewal in 2020, and if it is not renewed, the Decorah/Mabel arrangement would become null and void. “Local agreements cannot supersede statewide agreements,” explained Haluska. Kuphal said he anticipates the interstate contract being renewed, and Minnesota has similar commitment with the states of North and South Dakota. The North Winneshiek School District has had whole-grade sharing, or tuition reciprocity, with both the Mabel-Canton and Decorah districts since the 2001-2002 school year, the last year North Winneshiek existed as a high school. After North Winn's high school closed, North Winn students in grades 9-12 had the opportunity to choose either Mabel-Canton or Decorah for high school. Two years ago, North Winneshiek ended its 7th and 8th grade programs. At the time, Decorah expanded its whole-grade sharing agreement with North Winneshiek to accommodate those students and made a two-year agreement with Mabel, so North Winneshiek students who would eventually become part of the re-organized district still had the option to attend Mabel. Although the agreement allows Decorah students to attend Mabel-Canton and Mabel-Canton students to attend Decorah, it is, in essence, a one-way sharing agreement. “It is a de facto one-way agreement because there are no students in the Mabel-Canton School District who live closer to Decorah than Mabel,” explained Kuphal. When asked about transportation, Haluska said the rules are similar to open-enrollment. It will be the parents' obligation to get the students to school. When asked how the finances will work, Haluska said Decorah would act as a “flow-through” for supplemental state aid, the money Iowa districts receive per pupil, which is currently $6,891. That money would be paid by Decorah to Mabel-Canton for educating the student. The superintendents said a copy of the agreement as well as the application will be available online at the Mabel-Canton, Decorah and North Winneshiek school district websites, as well as via hard copy that can be picked up at any of the district offices. Applications are due March 1 of the year the student is requesting attendance in Mabel. Families who are undecided about whether or not to attend Mabel-Canton are encouraged to file the necessary paperwork anyway, even if there is a chance they may stay in Decorah. Completing the necessary paperwork ensures the student can attend Mabel, but does not obligate them to do so if the family changes its mind. This agreement will last until June 30, 2024, unless extended on or before Jan. 15, 2024.